To paraphrase Chicago Cubs Hall of Famer Ernie Banks, let’s commit two. Coach Albie O’Connell has a pair of new recruits for BU’s 2021 class. Center Danny Zhilkin and defenseman Roman Schmidt committed to BU following standout performances in the recent Junior Chowder Cup tournament, leading Maroon Hockey to the 2003 Division championship. Zhilkin, who scored the game-winner in the title game, earned Tournament MVP honors, while Schmidt was named to the All-Tournament team. A late 2003 from Mississauga, Ontario, Zhilkin had six goals and three assists in the Junior Chowder Cup. 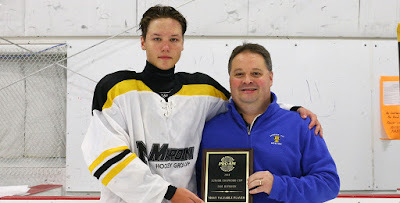 He is a 6’1”, 180 pound left shot from the Toronto Marlboros organization who played in the 2018 World Selects Invitational 15U (1-0-1). Next season, he’ll skate for the Marlies 16U in the GTMMHL. 4.25⭐️ is tall and strong with a powerful stride. Ontario native has elite hands with excellent vision and unconventional creativity around the net. Late 2003 will be a coveted OHL prospect. A grade in upcoming JCC report. Schmidt, a 6’4”, 210 pound right-shot defender, is a dual US/Canadian citizen. 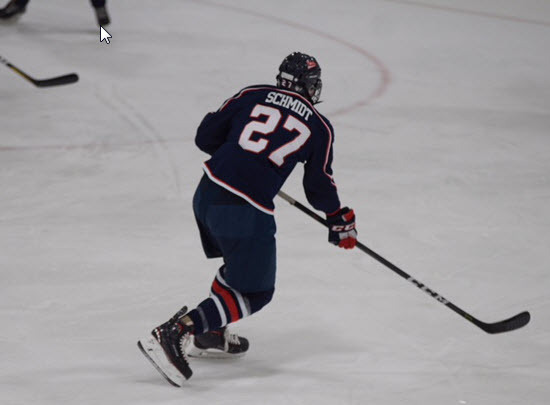 Playing up with the Mississauga Rebels minor midgets last season, Schmidt was ranked #7 on Priority Selections’ Top 10-Bantam Selections. Next year, he’ll skate for the Don Mills Flyers 16U AAA in the GTMMHL. Earlier this summer he played for the Oshawa Jr. Generals in the World Selects Invitational 15U (2-2-4) and in USA Hockey’s Select 15 Development Camp (0-3-3). ► Also participating in the 2018 World Selects Invitational 15U were BU’s first two 2021 recruits: Jeremy Wilmer (6-3-9) and Tyler Boucher (4-4-8). Logan Cockerill assisted on the overtime game-winner as Team USA defeated Sweden, 5-4. The U.S. takes on Finland today with puck drop set for 4 p.m. ET. NHL Network will air the game live.